Though Pollock’s first contact with Madison County took place in October, 1886, and it was the beginning of a long series of events that would impact the mountain people there, it seems unlikely that he actually visited Nicholson Hollow (also known as “Free State Hollow”) at the time. He does, however, mention it briefly, in the course of discussing his experiences of that month. The mountaineers were “wild and wooly,” particularly in the area known as “Free State Hollow” (so named because, for excellent reasons, sheriffs and deputy sheriffs stayed out and the people practically ruled themselves. Free State hollow, a center of the moonshine business, considered of a group of log cabins scattered along the Hughes River, most of which were located on the Stony Man Tract. Very few dwellers in Free State Hollow had ever been to the town of Luray, the women and children and most of the men had never even seen a locomotive and there was no reading or writing, the people being absolutely illiterate. 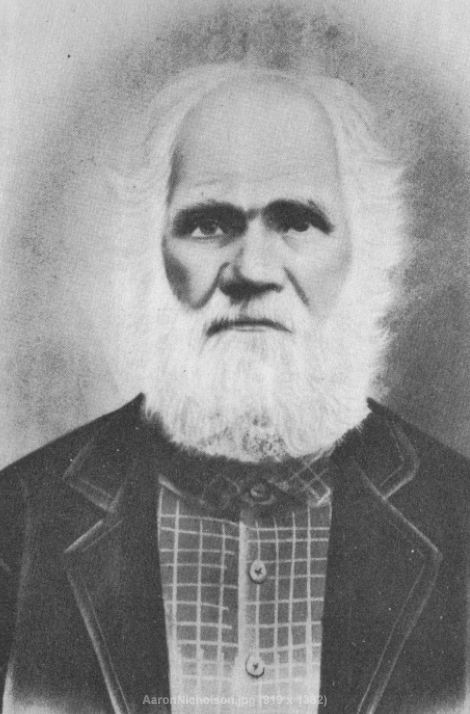 Old Man Aaron Nicholson [cenantua’s note… Aaron was born in October 1832, and died in 1911… one of my fourth great grand uncles; brother to Garnett] was the “grandaddy” of the entire clan and for that reason Free State Hollow was also called Nicholson Hollow. Mr. Printz had advised me to follow the same path that we had used going to Stony Man Peak and when I reached the top to descend on the other side, going east and continuing down until I reached the Hughes River, a small mountain stream whose course would lead me directly to Nicholson’s home. Dressed in a new corduroy outfit lined with blue mackinaw and with new leggings, trousers and a coat to match, I started off early in the morning, looking quite natty. In addition to a small lunch, I carried a new Kodak, one of the first of these cameras to come on the market. In the descent from Stony Man Peak to the Hughes River the going was very rough with cliffs and rocks everywhere. I had to twist and turn but I knew that as long as I was going down and following the headwaters of the mountain stream, I was all right. Presently a clearing and a log cabin came into view and I must confess that I was somewhat fearful as, unheralded and unknown, I approached the mountain settlement. A crude log bridge spanned the Hughes River and as I crossed it, various mongrel dogs came out raising a particular racket. I knew that it was unwise to carry a stick where there would be strange dogs so, unarmed, I walked boldly forward. Before the dogs could harm me, the cabin door, which was open, was filled with the massive, bow-legged form of Aaron Nicholson. I can see him at this moment with his snow-white beard, his face burned red by the sun, his heavy eyebrows and with his deep-set blue eyes looking at me with curiosity and amazement. As I talked the old man’s eyes traveled to the Kodak which seemed to fascinate him. He had never heard of photographs and I doubt whether he had ever seen a newspaper picture or an illustrated book. He then walked out, feet bare (as, in fact, were the feet of all Hollow people) and when he extended his hand, I knew that we were going to be friends. By this time the barking of the dogs had attracted the members of his family and they and the occupants of several other cabins below on the banks of the stream were now coming forward to see the stranger who had come into their midst. Gathering around, they formed a semi-circle in front of me. This talk evidently pleased the old man. He smiled (he really had a fine face) and all my fears were gone. You should have seen the faces of this group as I made that announcement! Taking the Kodak out of the carrying case, I explained how it operated and asked several of the mountaineers to let me take their pictures. Nothing doing! They seemed to think that that would be a terrible thing but finally a couple of the young men, tempted by a silver dollar which I offered, agreed to pose. Also, I seemed to please the young women. Coming up, they examined my cap, felt my corduroy coat, smoothing it down with their hands, admired the blue mackinaw lining and chattered among themselves like a flock of magpies. I told a couple of funny stories, sang several songs and all of them became quite friendly, giving me apples and asking me to remain to “git a bite,” but the men came back with a fine string of trout which they had taken from the pool just below the house, and time was pressing. As I prepared to leave, the men whose pictures I had taken asked to see their photographs and it was very difficult to explain to them that the pictures could not be taken out of the box immediately but had to be carried away, treated chemically and then printed by the sunshine. This idea seemed preposterous, they demanded the pictures and I was in a quandary but, finally, I opened the Kodak. Taking out the roll and being careful not to expose it, I told them that the pictures were there, rolled up, and that I would have to carry them to Washington after which I would return and give the pictures to them. Eventually they believed me and then I bade all a fond farewell. This, my first, was a very friendly visit but I doubt whether it would have been so if the mountain people had been aware of the fact that my father and Mr. Allen owned most of the land upon which they were living. The conclusion follows, in part 3. Hello I am really glad to see this post it made me get out my family bible as well. I would like to touch base with you if possible. The Nicholson’s are my direct relatives as well as my mother was a nicholson and my grandmother was born on old rag I have lots of stories from my great grandfather as well.